Happy Holidays from the woods! I love this time of year at the cabin when we get to make fires and be cozy. For some seasonal festivity, I decorated our mantle with fresh greens, limes, persimmons and candles. Hanukkah started last night and we had a little gathering to kick it off. 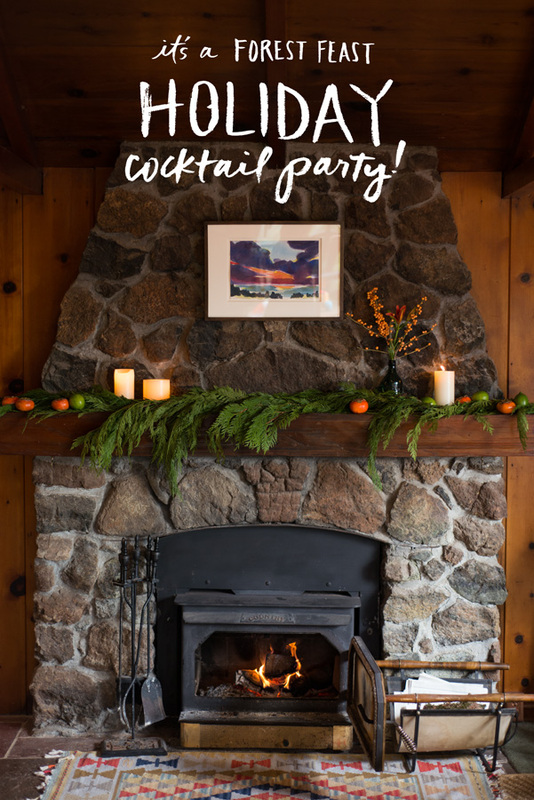 On the menu: Zucchini Latkes and Holiday Cider Mules, plus a spread of cheese, crackers, fruit, nuts, chocolates and other bite-sized goodies. Latkes (potato pancakes) are a traditional Hanukkah food, and mine are made a bit lighter by using half grated zucchini. (I use the fine side of the box grater for both.) These are great for entertaining because they can be made ahead and served warm or at room temperature. Just add the toppings before serving. They work well as finger food so you can skip the silverware and simply put out small plates and/or napkins. 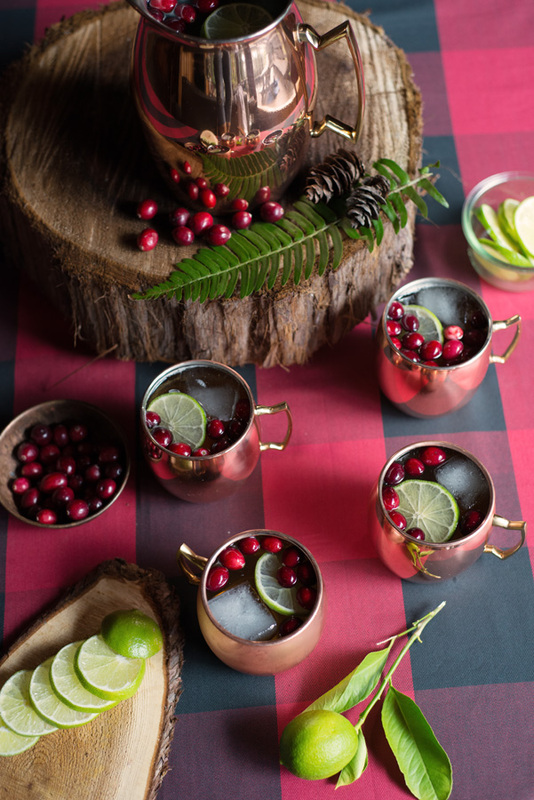 I have always been crazy about copper, so when I saw these copper mugs at Pottery Barn, I had to do a holiday twist on the Moscow Mule. Mine has added sparkling apple cider and a colorful, seasonal garnish. (For a non-alcoholic version, just leave out the vodka and it’s still delicious.) It’s a festive drink for a party and can easily be made in a pitcher or punch bowl, or by the serving. 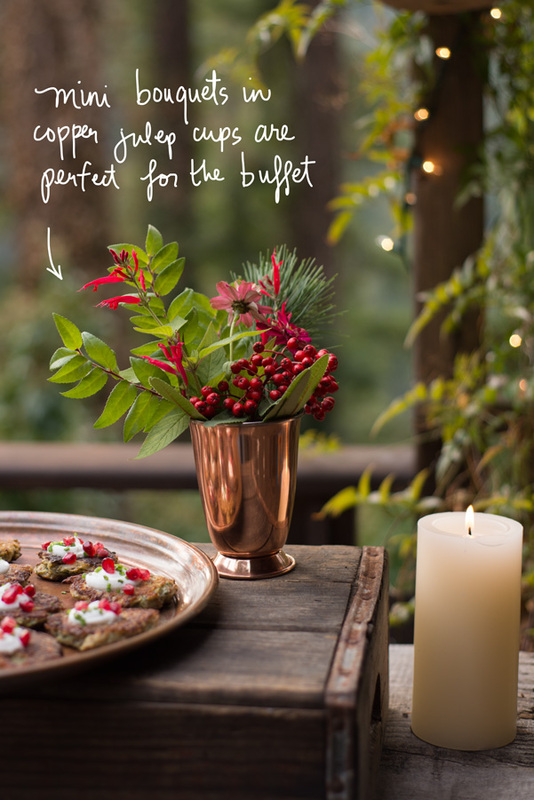 I also used their copper julep cups to hold breadsticks and to make mini bouquets which are the perfect size for a bar, buffet or table centerpiece. For cocktail parties, we also usually serve wine, beer and a couple of non-alcoholic options like juice and sparkling water. What are your go-to holiday appetizers and drinks? Cheers to a happy, safe and peaceful holiday season! This post was done in partnership with Pottery Barn. Additional source links: red checked tablecloth, pillar candles, wooden 3-tiered tray, victorian tumblers, Tortoiseshell old-fashioned glasses.